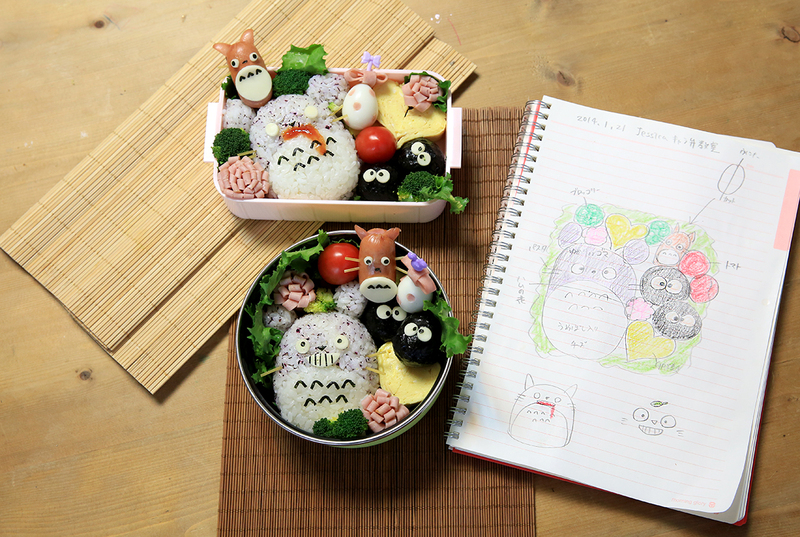 Wow wee~! 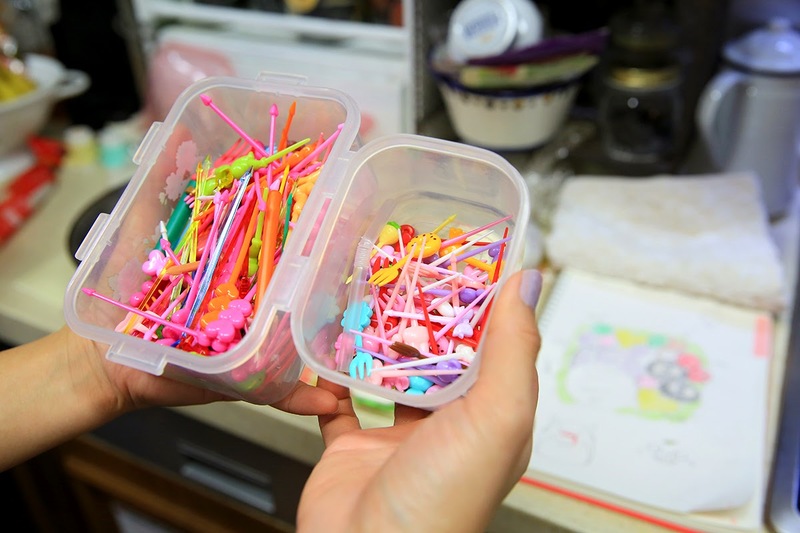 Hasn't it been a long time since a DIY was up in this blog!? 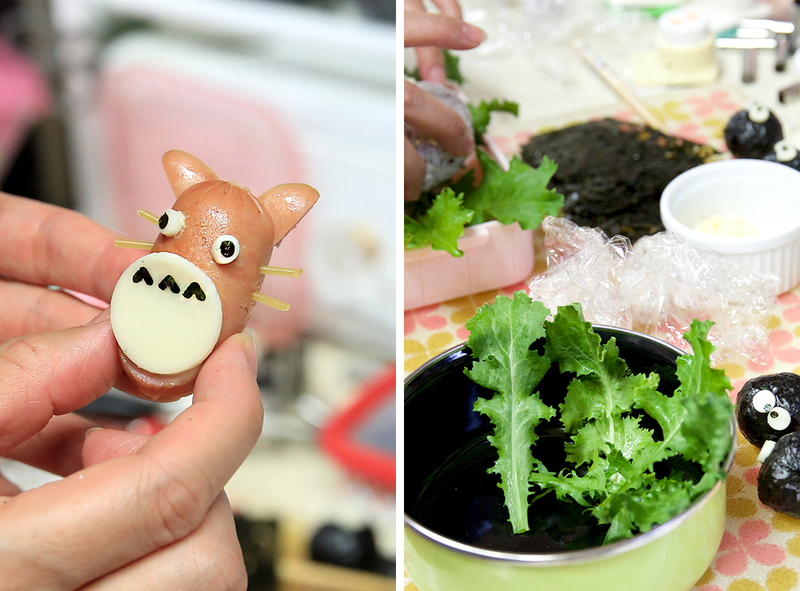 Anyways, today I have here for you a Totoro Bento tutorial that was in session at my friend Mayumi's place earlier this year. After brushing off the slackness of the immense editing it takes to post this tutorial. 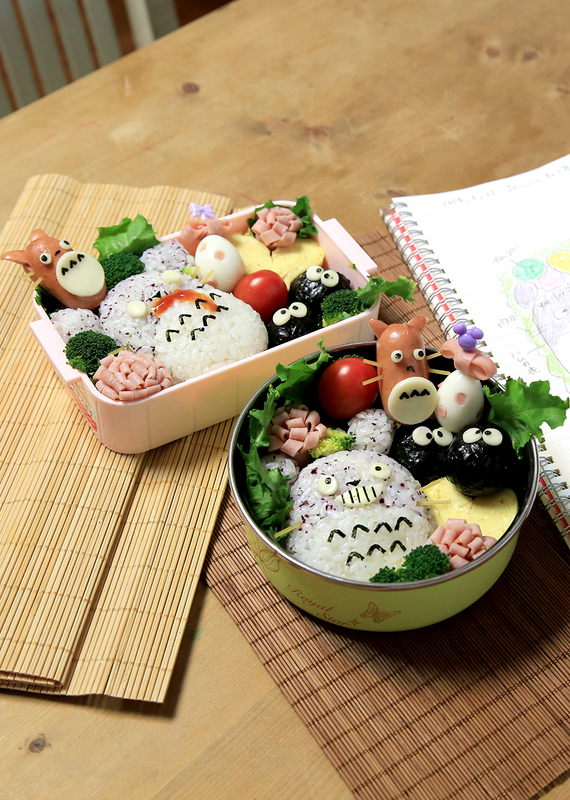 Here below are step by step guide to create your very own Totoro bento box that will be difficult for you to eat afterwards. 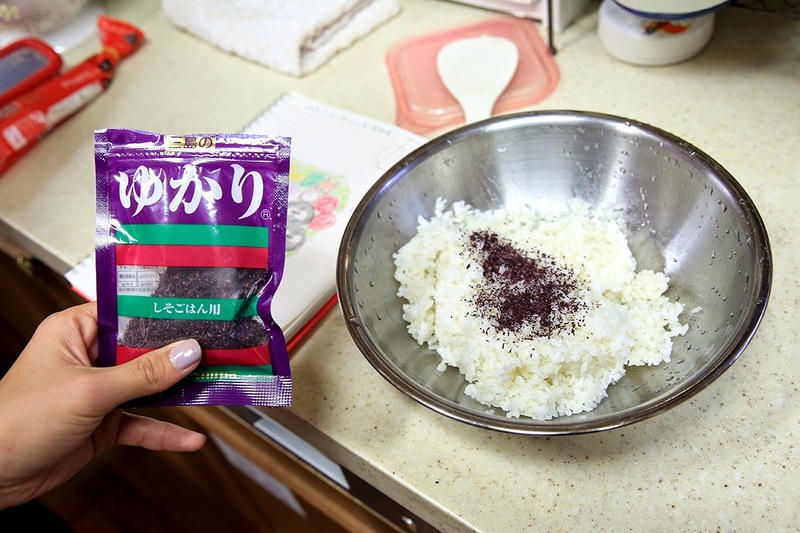 To create the Totoro's grey body- crush black sesame seeds or buy this pack of natural rice favouring from your local Japanese sundry shop and in a bowl of rice, mix well. 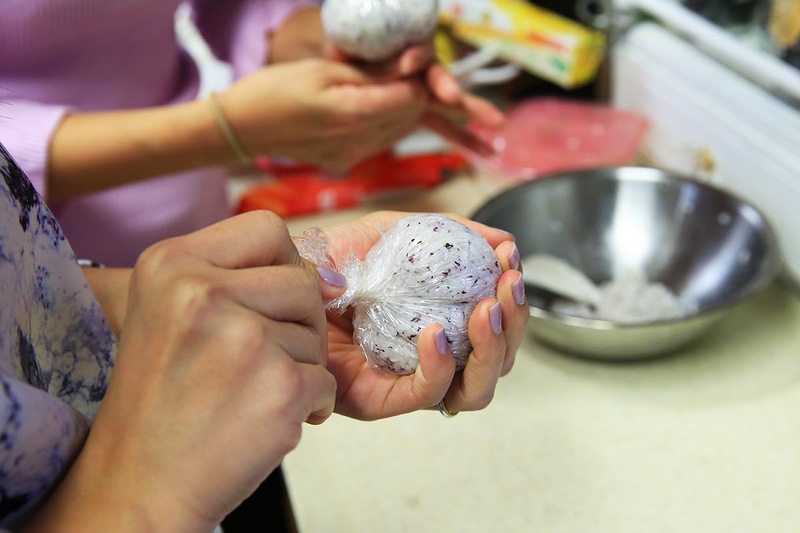 Place a spoon full of rice onto a cling wrap, shape it out and set it aside without removing the cling wrap. 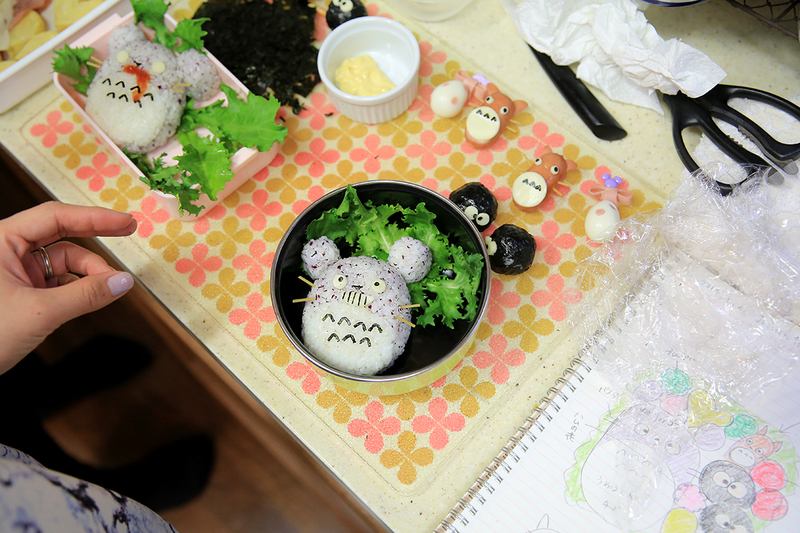 Tip: It would be helpful to have a Totoro visual/reference with you while making the bento. 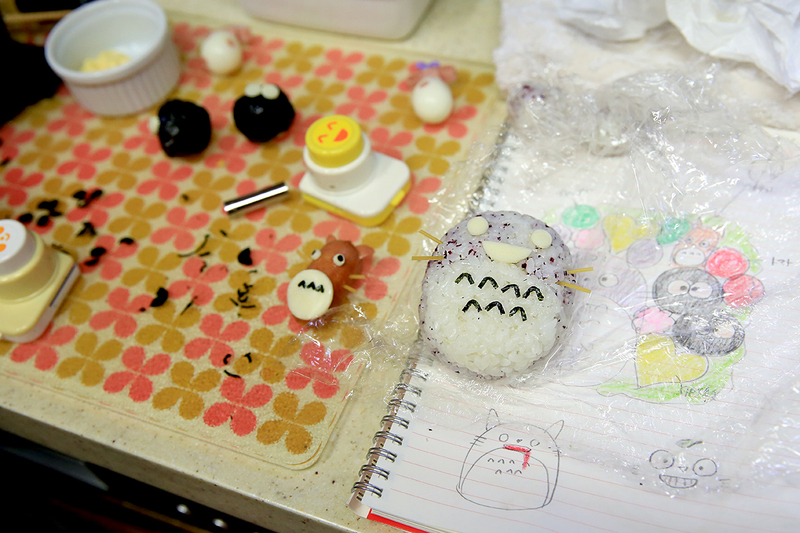 On another cling wrap, shape the tummy of Totoro. 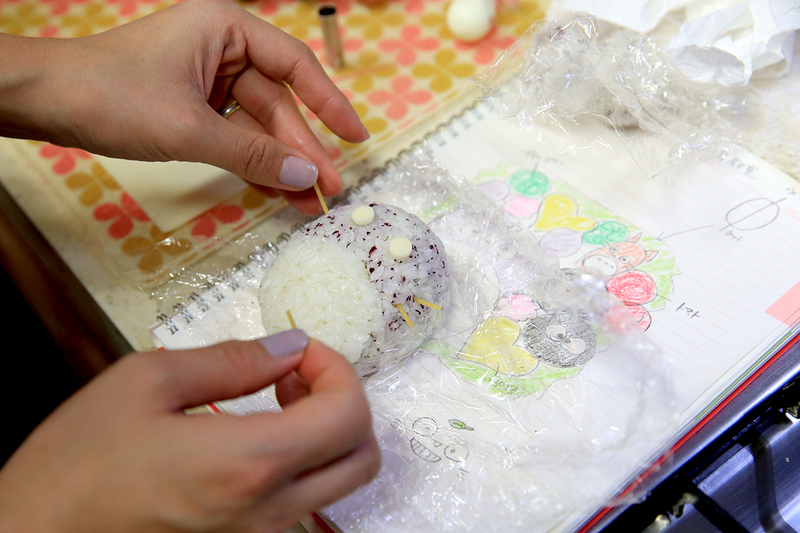 Combine the tummy to the body and separately form the ears before setting aside with the cling wraps still on. 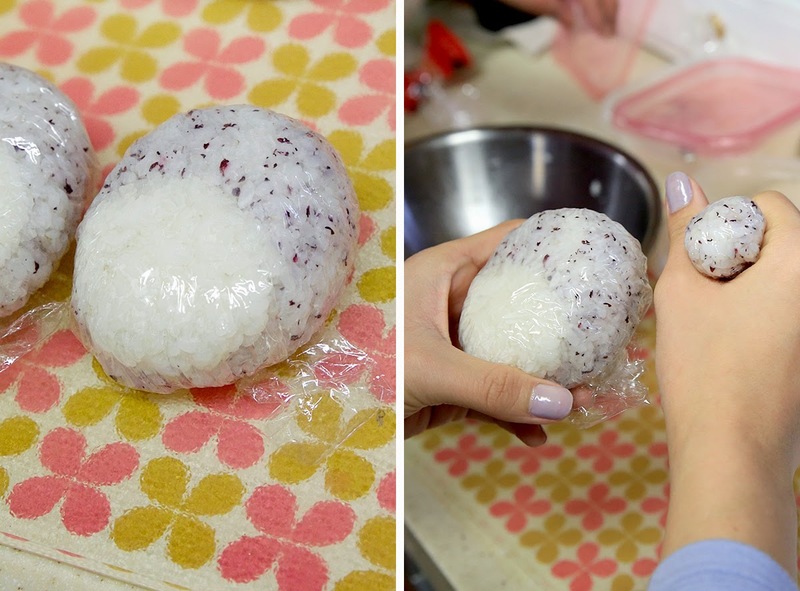 Tip: Removing the cling wrap would harden the rice, so DO NOT remove till the end. 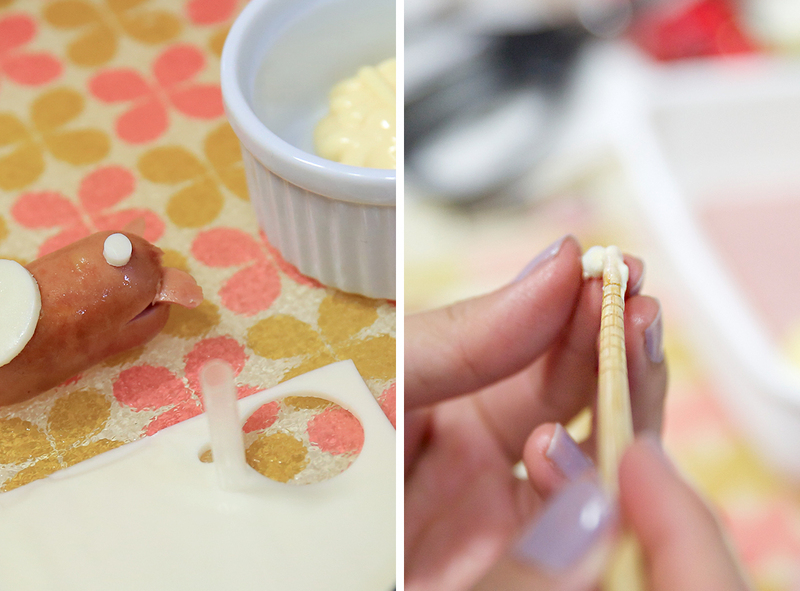 Prep the smaller details on the side as you go on~! 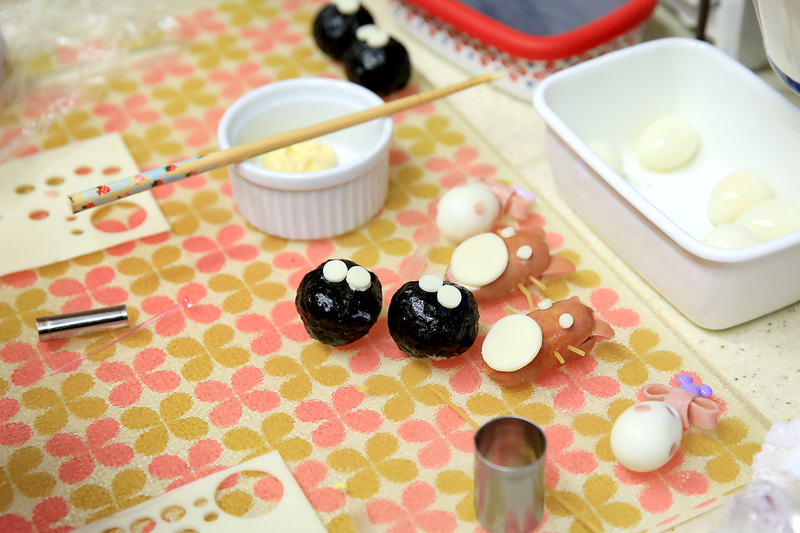 The making of Susuwatari- roll 2 rice balls and wrap it with seaweed sheets. 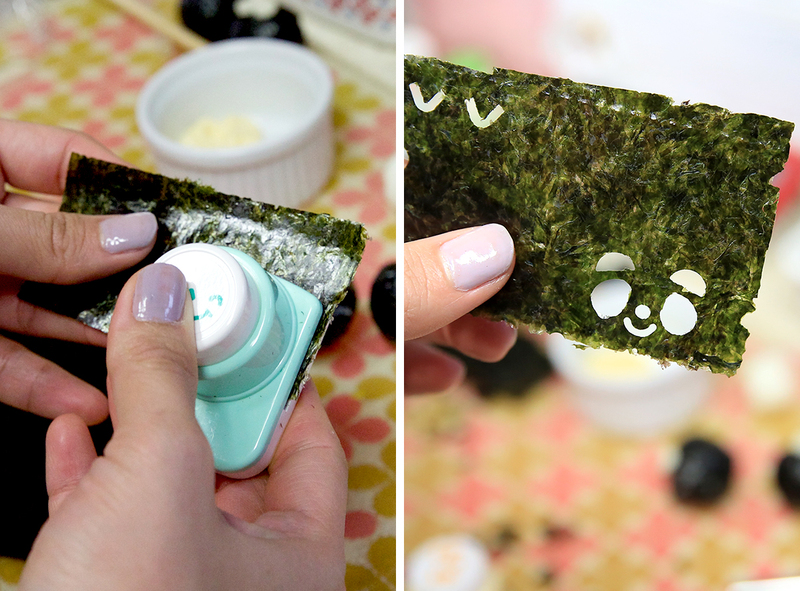 Place a little water to help the seaweed to stick onto the rice and place it aside as you go about doing other bento details. 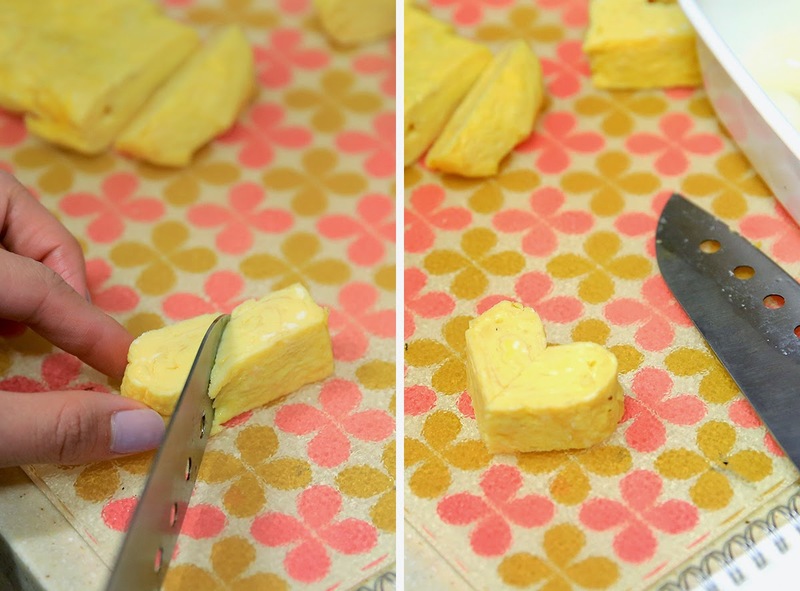 Making heart shaped tamago - with just a cut! 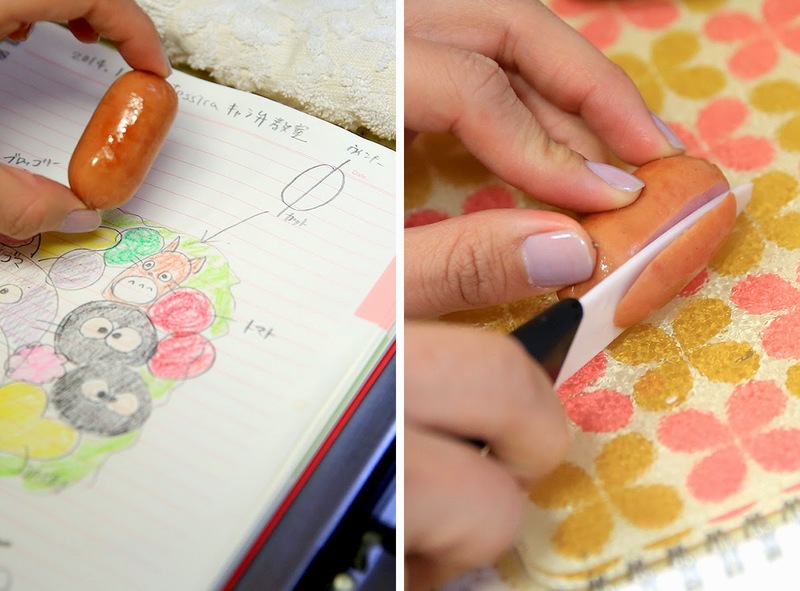 Tip: To get the best looking heart, cut a few and find the perfect half. 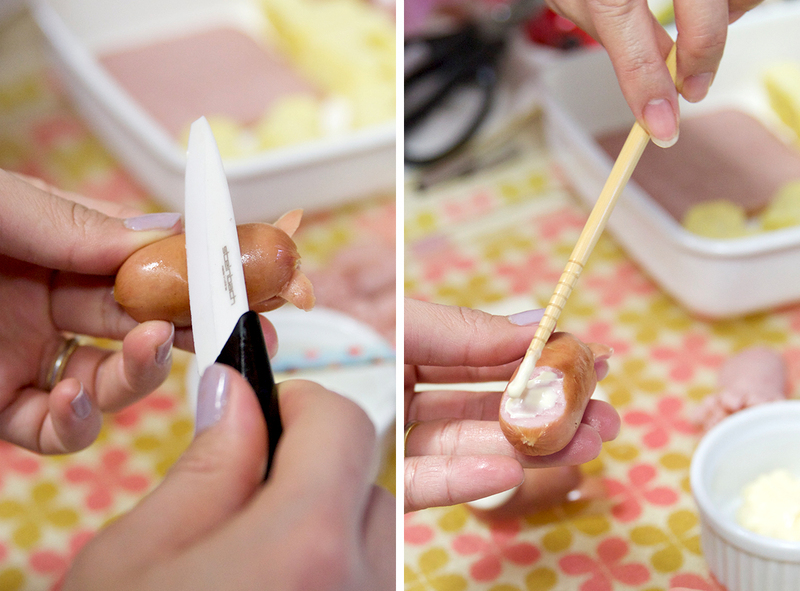 Mini totoro with cocktail sausages- cut 1/3 of the sausage (as shown above). Slice 1/3 at the top and use the previous cut to make the "ears". 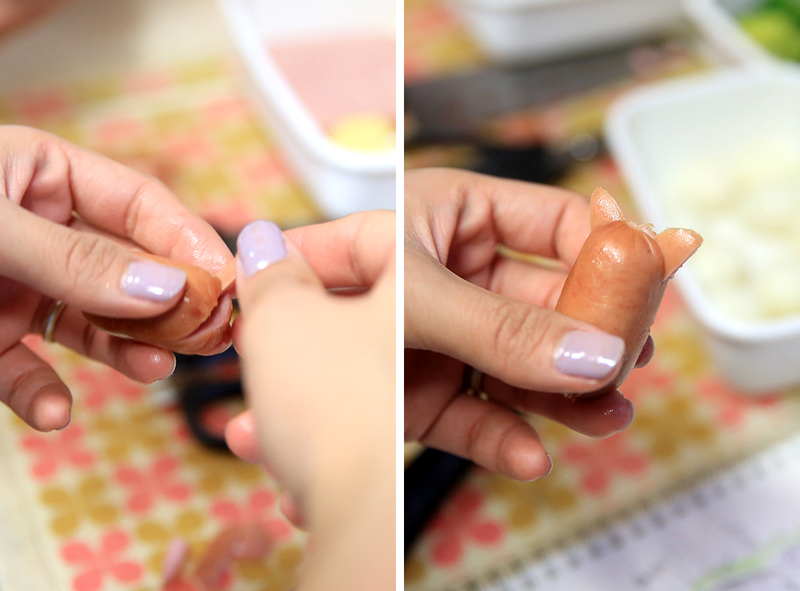 Insert the ears into the sliced top. 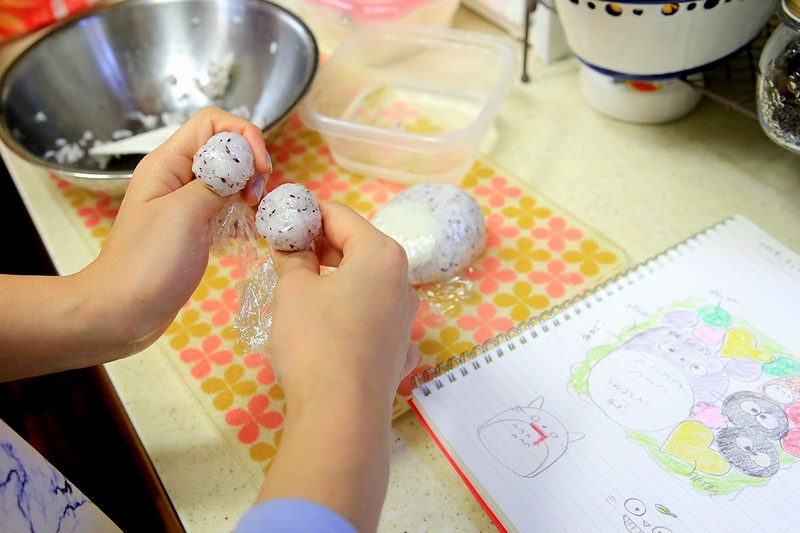 Create a stomach dent by craving a little part of the "stomach" and then add glue (mayonnaise). 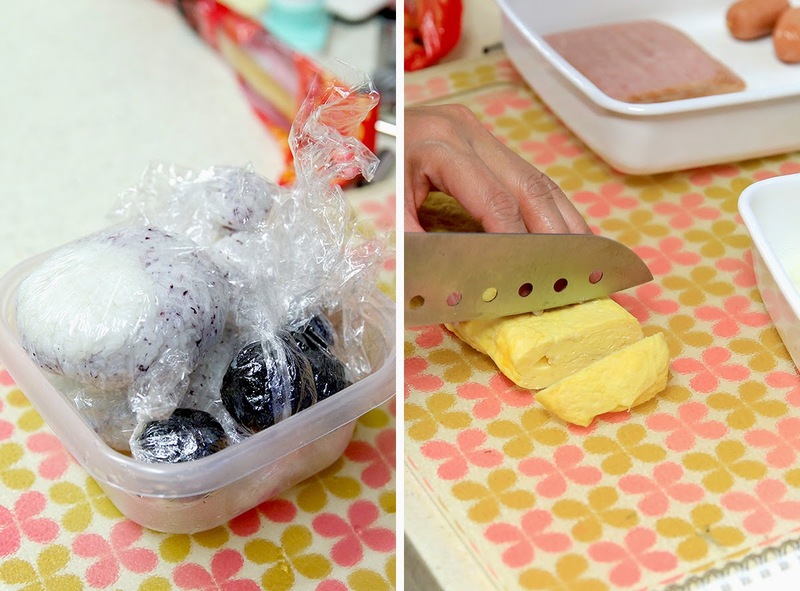 Using a cookie cutter, cut out the round "stomach" and press firmly onto the "body". *It should stick well since the mayo glue was placed. 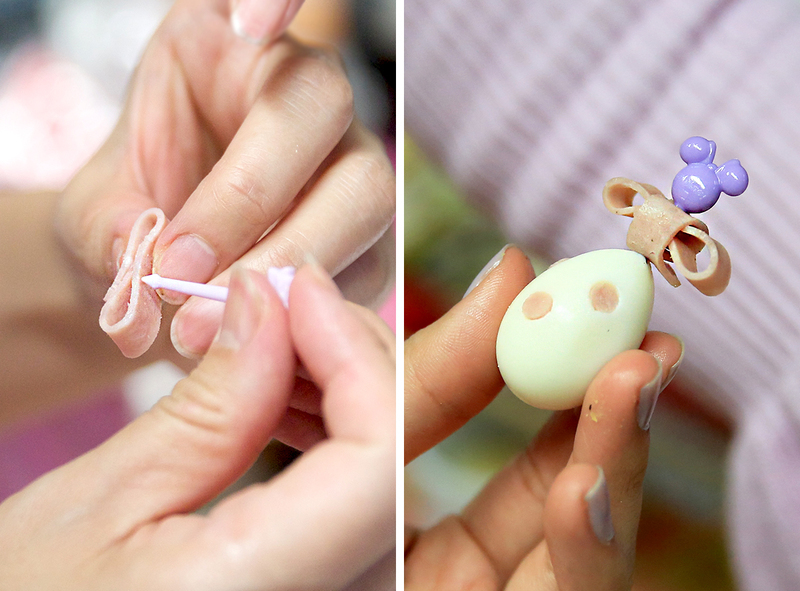 Use a straw to cut our the "eyes" and glue it on with mayonnaise as well. 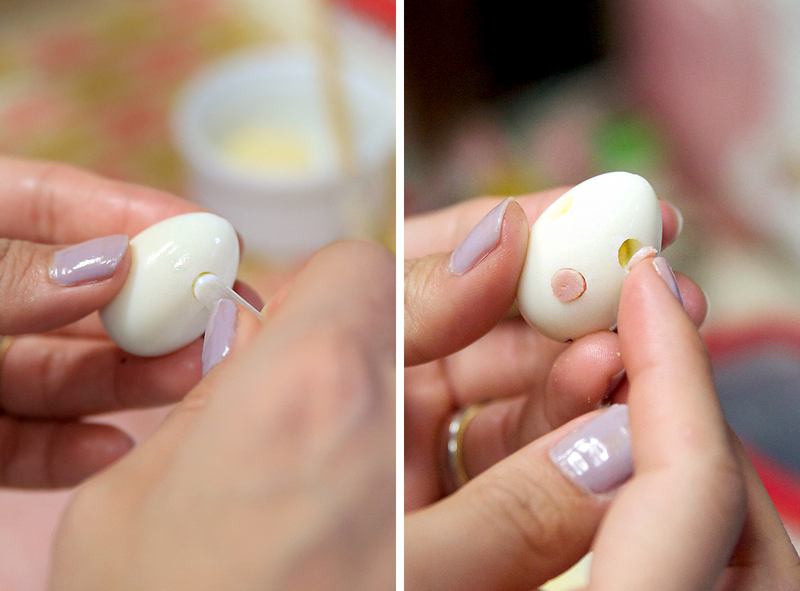 Making polka dotted ribbon quill eggs by using straw to "scoop" out the egg white and then replacing it with ham. 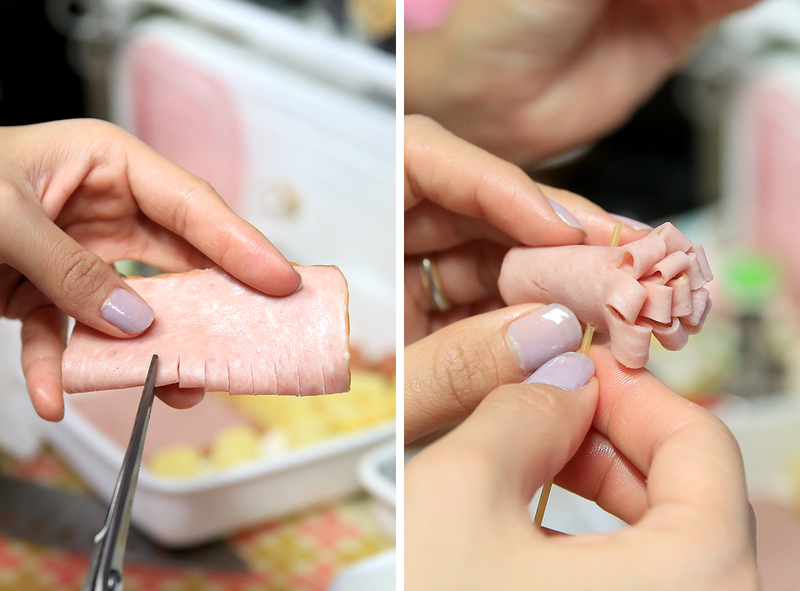 Using the same straw, make circles on the ham and it will fit perfectly~! The ribbon is made out of ham- just cut 2 stripes and shape it as shown above. 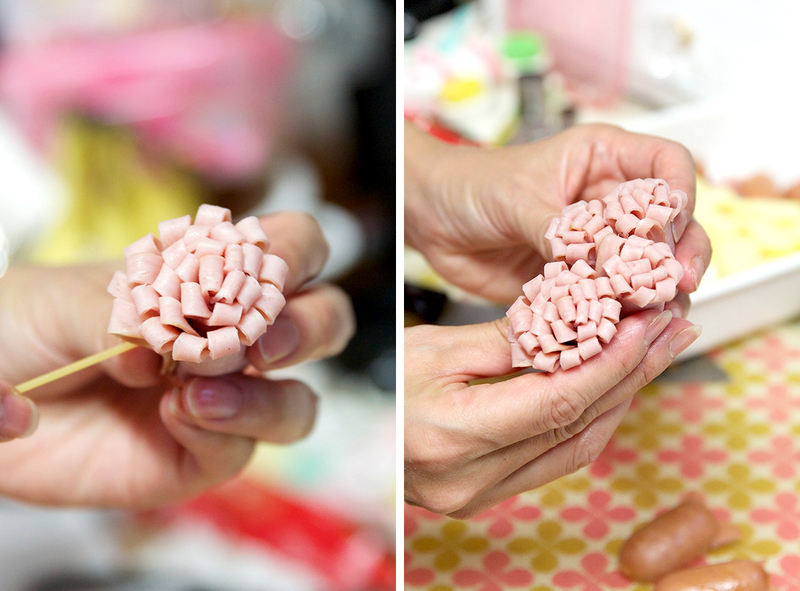 Making ham flowers are so easy! Snip snip, roll and fasten with a stick of spaghetti. 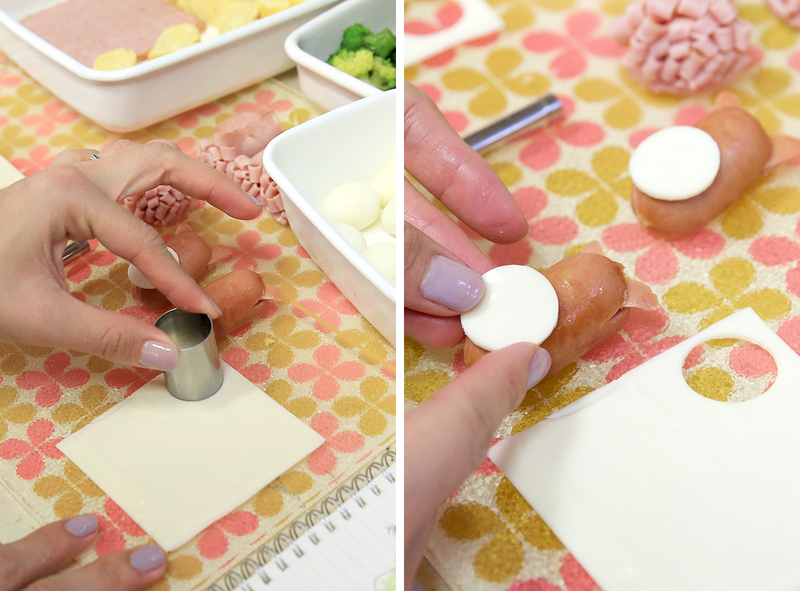 If you desire bigger blooms, roll on more ham twice or thrice! 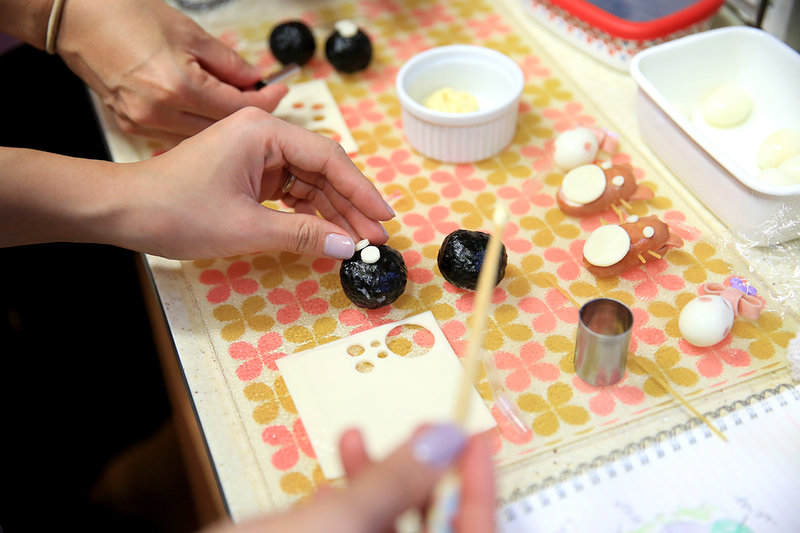 Back to the Susuwatari balls- on a slice of cheese, make perfect circle for the eyes by using a straw. Use mayonnaise to glue on the eyes. 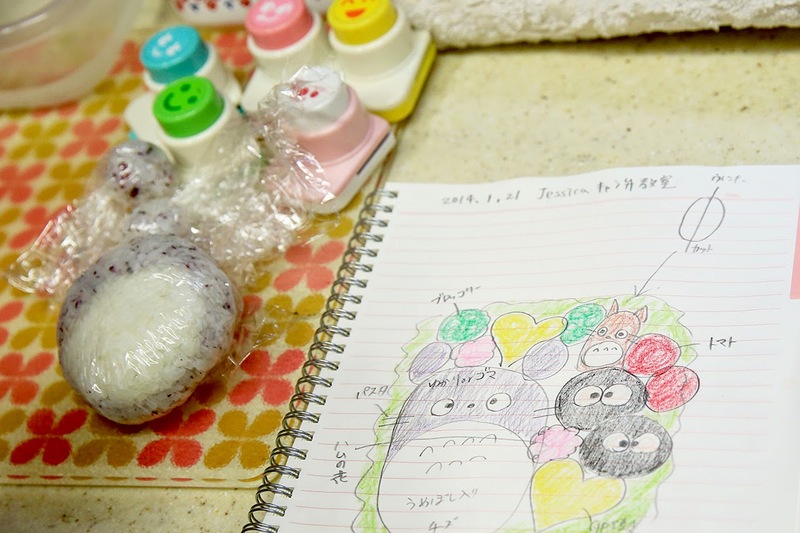 It's time to add on details to bring the Totoro to live! 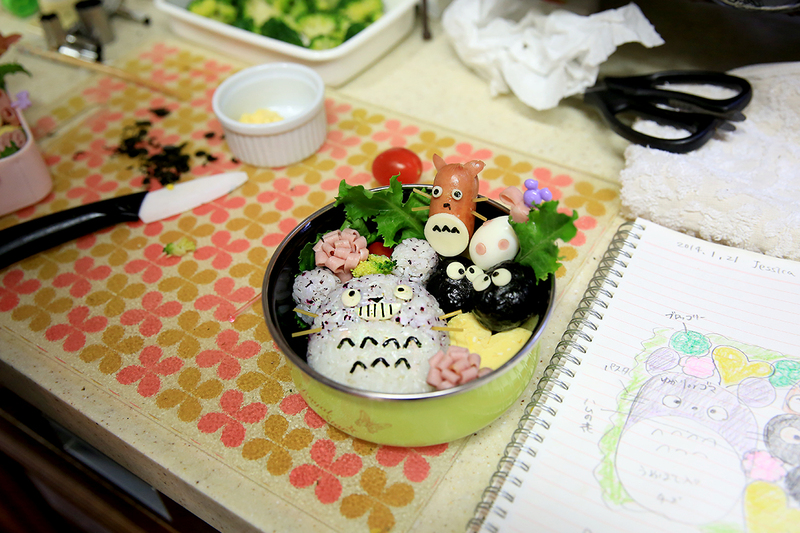 Use cheese for the eye balls, seaweeds for the iris, spaghetti for the whiskers and seaweed punchers for the finer details (below). 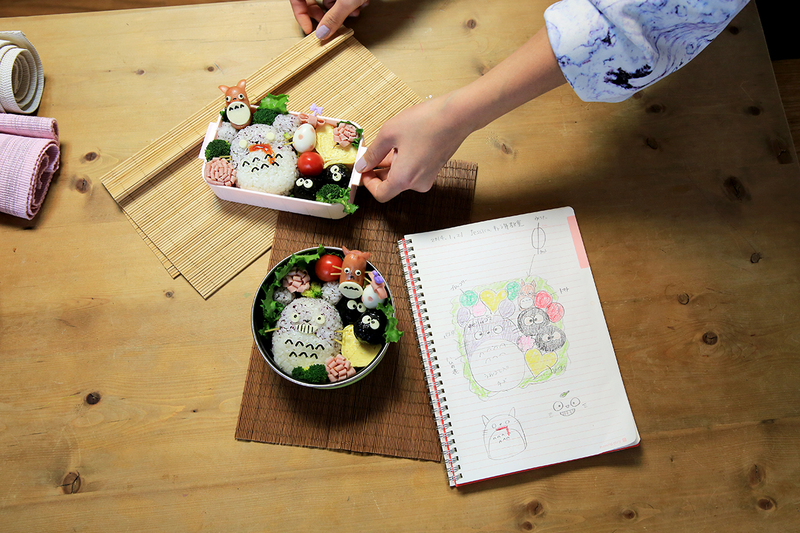 Once the seaweeds are punched out and set in place, prepare a small container to fit in your masterpiece! 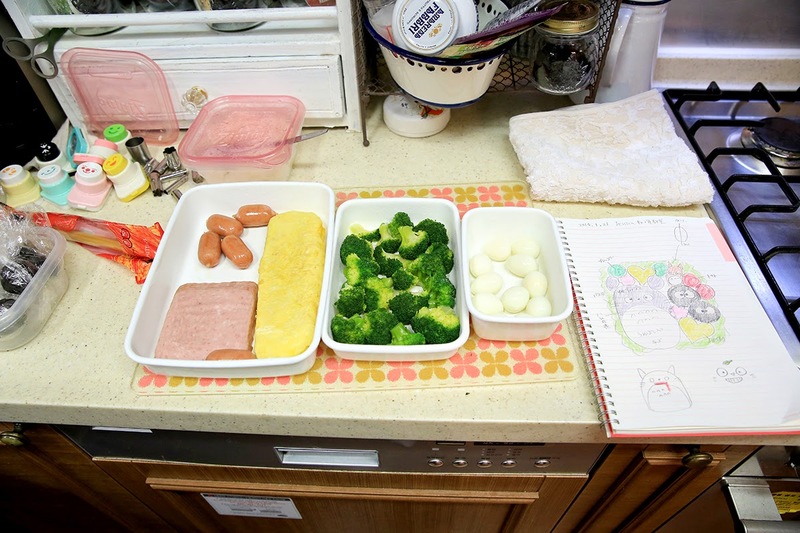 Tip: A smaller container would be a better choice to give the bento a fuller look. Place your salad leaves and the bigger details before moving on with all the smaller details you prepared. Decorate as desired. I hope you've find this little post inspiring and go give GO! 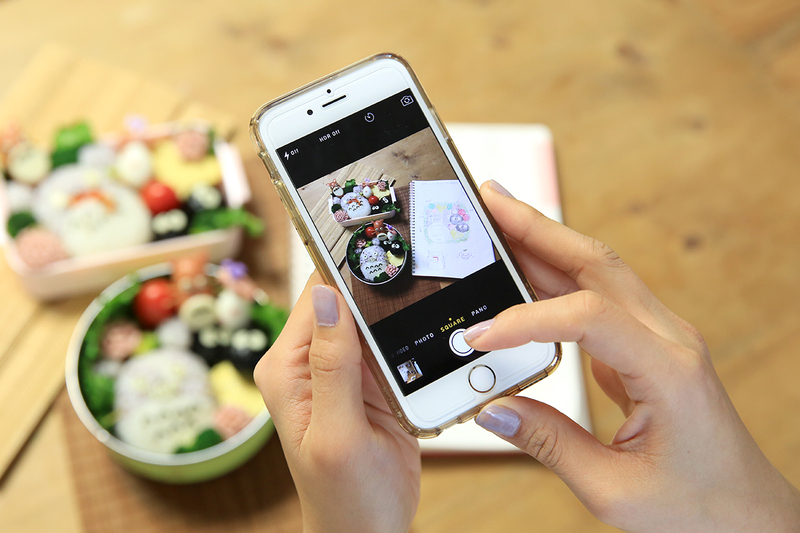 *Follow Mayumi on Instagram to get a peek into her wonderful Japanese kitchen- you'll be envying her skills and kids who are so blessed to have cute food to eat errrrday.